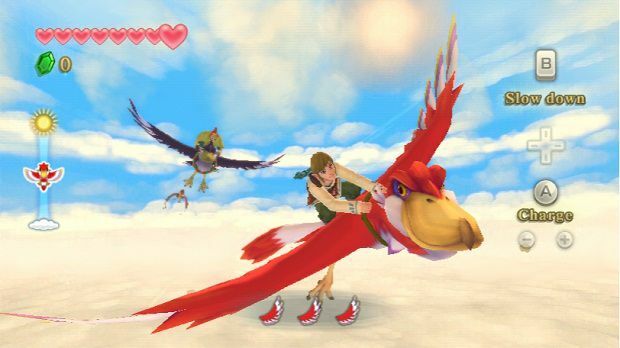 The Legend of Zelda: Skyward Sword features familiar main characters, engaging story, amazing watercolor-like visuals, MotionPlus controls, and a huge replay value as Link and Zelda are treated as adventurous equals who live in the clouds of Skyloft. 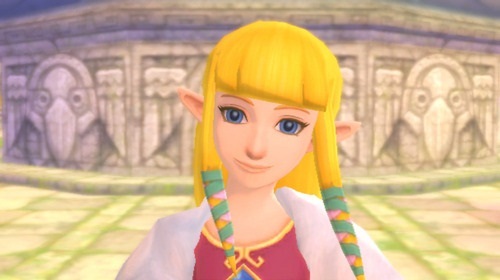 The Legend of Zelda: Skyward Sword requires a medium to high reading level since the game has no voice acting here with language translations in English, French, and Spanish. The timeline begins at the beginning of the Zelda games series. This e10+ rated game Familiar contains character archetypes, but they entertain and endear – the woman to woo, the heroes, the villain, the rival, and his comic relief sidekicks. The main villain, named Ghirahim, has some great dialogue while Link’s classmate Groose and his cronies also factor into events. Link, one of the heroes, does not immediately enter into the story – not a reluctant hero, but needs a little prodding, especially in the morning. 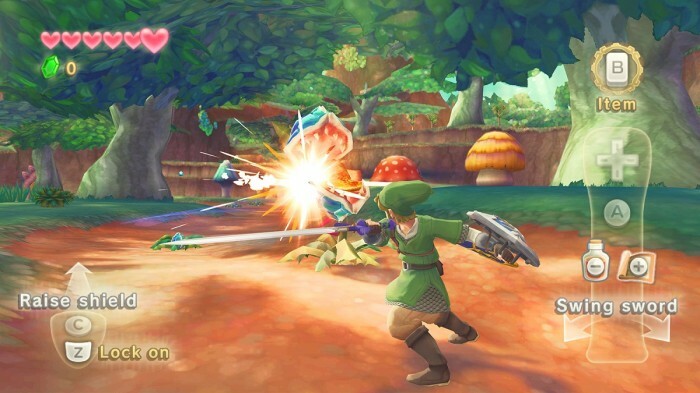 Zelda, the other hero, is Link’s equal here though her high status makes her a vulnerable target. Therefore, given the timeline, developers have the opportunity to re-launch this game series from the beginning. 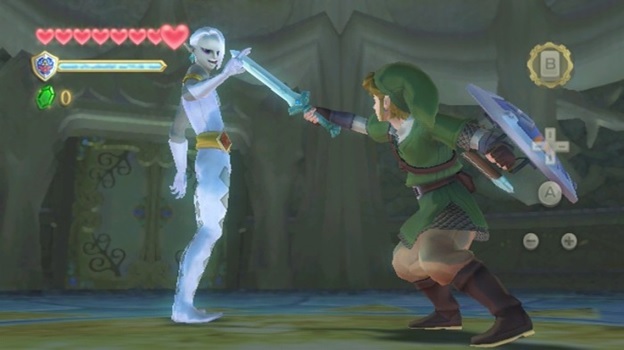 Time travel also factors into the story as Link’s helpful guide through this world, Fi, puts him on the path towards fighting the evil below with the special Skyward Sword. This story also incorporates elements from the other games, so it becomes a nice homage and possible send-off. The story centers on a special “wing ceremony” where Link seeks knighthood. His best friend? Zelda, of course. These two childhood friends have formed a special relationship, so when the story shifts to the “world below”, a.k.a. Hyrule, and Link must pursue Zelda players experience further emotions involving sacrifice, bravery, and admirable morality. Authentic emotions build the personal investment in the game and the desire to finish it. Complete game conquerors can experience the Hero’s Quest that restarts the game at a higher difficulty. The side missions add to the immense replay value, but some continuity issues, linear limitations, and lack of intuitive situations hinder progress at times. 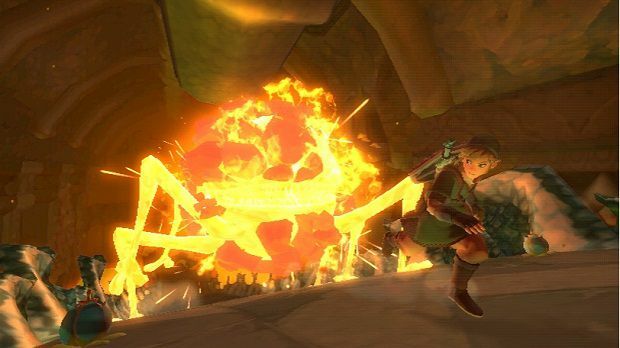 For example, Link’s ability to hold a pet in the beginning seems to lead towards greater things, but this element literally disappears after entering then exiting buildings. More shortcuts and multiple solutions for the simple tasks can improve the experience. The graphics include better maps (access with + button) and expanded heads-up display options, which act as an on-demand help system that does not clutter up the screen if players choose. The soft palette blends the colors well without hard edges. The regular dungeon settings mix with deserts, lush grasslands, and volcanic lands, which players revisit previous environments for new reasons. The MotionPlus controls are required for this one player experience, so players can perform the actions, including fighting and flying, successfully. These controls work well and require minimal adaptation…like many worthwhile games. The standard third person view unfortunately switches to first person when scanning the area instead of fluidly offering these options in real-time gameplay. Players use the MotionPlus remote for sword/weapons and other main actions and the nunchuk for the shield and movement. Use both for combination spin attacks. The swordplay mechanics feel great through the remote and even include a special nunchuk combination action where player press the C button and point the remote throughout the environments to discover things. The other varied offensives (bow, slingshot, whip, etc.) provide a nice mix that refreshes each adventure filled encounter. Collectibles count towards weapon and power upgrades in this new system as well. Players get a sense…or fear of flying even before mounting the flying birds, a.k.a. Loftwings. Mounts on the ground would be much safer, but players experience a daring free fall and an initially desperate whistle call for the birds instead. A seemingly unnecessary risk, but an exhilarating one. The first Loftwing race challenge feels like less skill and more luck. Adjustment is biggest key here as players aim with the remote and tilt it for appropriate corrections. On the nunchuk, tap Z for view centering or enemy lock ons. On the remote, the 1 button show inventory while the 2 button provides gameplay help. Use the A button for dashes and B button for item collection. Players can also find help within the game in special areas or by talking with characters. Link automatically jumps when he reaches a ledge, but make sure to get the angle right. He also does everything faster in this game including climbing – a welcome update. The stamina meter lets players know when characters need a break. A remote control flying beetle allows players to collect and interact with out-of-reach items while special actions include powerful wind gusts (also used to uncover hidden items) and digger claws. Musical instruments also play a key role in-game progression and simple enjoyment while the musical score enhances the emotional scenarios. Initial production copies include a special Zelda orchestral music CD performed at The Legend of Zelda 25th Anniversary Symphony Concert. The special bundle ($124.99 suggested retail price) includes The Legend of Zelda: Skyward Sword game, music CD, and gold Wii MotionPlus remote with Triforce symbol. A solid sequel to the 2006 predecessor Twilight Princess (***1/2 out of four stars), originally released on GameCube then updated for the Wii. Hopefully Nintendo does not take five years to make the next quality game installment. This entry was posted in Video Game Reviews and tagged Legend of Zelda, Michael Siebenaler, Mike Siebenaler, Tall Writer, video games, Zelda. Bookmark the permalink.